Most of Volkswagen’s latest cars have shifted over to its MQB platform—which affords them plenty of powertrain and technology upgrades—but not the “new” 2020 Volkswagen Passat coming to the Detroit Auto Show. Nope, the new Passat is instead just a reskinned version of the same car introduced back in 2011, and VW isn’t even afraid to admit it. 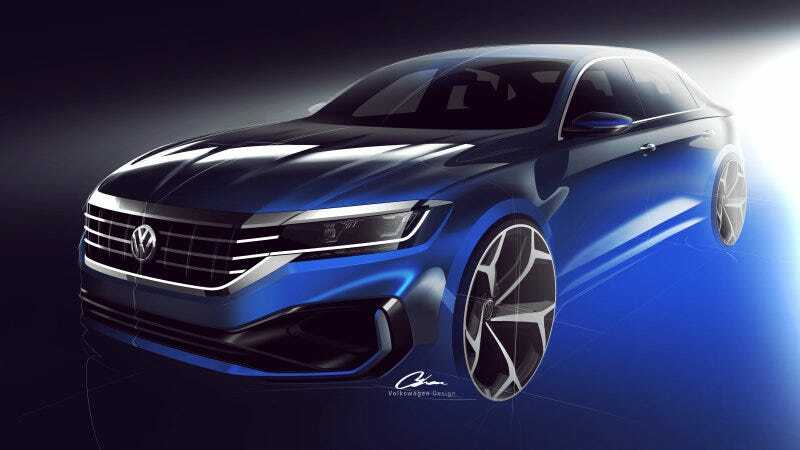 While we have to wait until January to see the new Passat, VW did offer AutoGuide some design renderings and an early in-person look at the car. According to AutoGuide, VW wasn’t even shy about admitting they didn’t bother moving the car over to a new modular chassis because the slumping demand for sedans wouldn’t make it worth the cost. There isn’t a whole lot changed on the interior, but it does feel new and different from the outgoing car. A redone center stack features updated VW infotainment along with touch-capacitive buttons. The dash design isn’t revolutionary, but simple, straight lines show VW is playing it safe. The 2.0-liter turbo four-cylinder engine with 174 horsepower remains as well, except now with an improved but hardly substantial 207 lb-ft of torque, and the same 6-speed auto. The car also will now be available with lane-keep assist, automatic emergency braking and adaptive cruise control. AutoGuide reports five different trims will be available, including an R-Line with 19-inch wheels and fake quad exhaust tips, but it’s scheduled to go on sale after the much more impressive Arteon sedan in the summer of 2020. I’m sure phoning it in will be the thing that saves the sedan market, VW. The good news is that VW has sold a lot of them since 2012, so we’ll see if some cosmetic changes can keep that going. Have You Ever Owned A W8 Passat, The Most Infamously Unreliable VW? Hold Onto Your Hats, Here’s How Volkswagen Might ‘Spice Up’ The Passat!